NEW DELHI: India will carry out maiden tests of its air-launched BRAHMOS supersonic cruise missile from specially-modified Sukhoi-30 fighter planes from November, BrahMos Aerospace CEO Sudhir Mishra told HT. Four flight tests will be conducted over a period of six months before the missile is declared ready for deployment on the fighter planes towards mid-2016. The actual missile will be tested in April 2016 following three dummy tests. The Nasik division of Hindustan Aeronautics Limited has modified two Su-30 fighters to carry the 2.5-tonne missile, the world's fastest supersonic cruise missile. The second aircraft is expected to be delivered to BrahMos Aerospace by September-end. The BRAHMOS missile, an Indo-Russian joint venture, provides India the capability to hit targets 290km away at nearly three times the speed of sound. The missile's land and naval variants -- 500kg heavier than the air version -- are already in service. "The missile will give the IAF extended range capability. No other Air Force has such a powerful cruise missile in its inventory," Mishra said. The BRAHMOS missile has three existing variants: Block-I (anti-ship), Block-II (land to land) and Block-III (with steep dive capabilities for mountain warfare). The BRAHMOS missile is also expected to be deployed on six high-tech submarines to be built in India under the Rs 65,000-crore Project P-75I. Mishra said the joint venture was also pressing the accelerator on the BRAHMOS NG (next generation) missile project. Once ready, the NG missile, weighing only 1.4 tonnes, can be deployed on smaller warships and medium-weight fighter planes. "We are in the process of freezing the design and specifications of BrahMos-NG. We are also talking to users to give us an indication of their requirements," Mishra said. 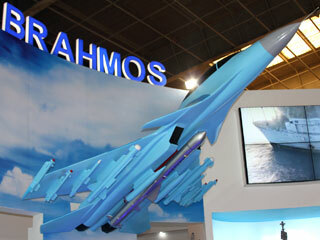 BrahMos Aerospace is also developing India's first hypersonic missile. Capable of travelling at a speed of 8,575 kmph, the missile could be ready in five to seven years. BRAHMOS-II (K) will be capable of taking out hardened targets such as underground bunkers and weapon storage facilities at seven times the speed of sound (Mach 7). As first reported by HT on August 8, the K in it is for Kalam.